Drive, hike, sail or ride. With the rugged, waterproof and multi-purpose Garmin nuvi 550 sat-nav, you can do it all. Garmin nuvi 550 is geared for adventure and ideal for those who want to go out and explore the great outdoors in every way they can. With a built-in compass and integrated Wherigo and Geocaching player, this sat-nav goes beyond navigation to bring the fun of the many family treasure hunts and adventures available online. With detailed European street maps and topographic shaded contours, this easy-to-use sat-nav is the perfect companion for navigating your active lifestyle. Garmin nuvi 550 has been discontinued. Accessories are still available for your nuvi 550 click here and to view maps click here. Released in 2017, the replacement and equalivent model to the nuvi 550 is the Garmin GPSMAP 276Cx. Four bespoke user modes bring customised features for driving, boating, walking and cycling. This flexible navigator combines the advanced navigation and large colour display of Garmins in-car sat-navs with the rugged resilience of our outdoor GPS handhelds. Slim and streamlined, it fits neatly into your pocket, bag or backpack, with a removable, rechargeable lithium-ion battery that packs in eight hours of power. Optional mounts for each mode of transport make it an even better fit. Garmin nuvi 550 comes equipped with the latest technology from Garmin including sophisticated NAVTEQ mapping data and waterproof card slot to load different types of mapping such as TOPO for outdoor navigation and BlueChart g2 cartography for marine use. Garmin nuvi 550 makes driving safe, simple and stress-free. Its built-in, unique driver safety system contains details on hundreds of fixed, mobile and temporary safety cameras, variable limit and red light speed cameras across Europe. When you approach a camera, it sounds an alert and shows an overspeed warning and the speed limit to help you travel responsibly. The nuvi welcome screen greets you with two simple questions: "Where To?" and "View Maps." Just tap the colour touchscreen to look up addresses and services and for voice-prompted, turn-by-turn directions to your destination. Add optional traffic services for live traffic alerts which use data from real cameras located every two miles along every major route. Garmin nuMaps Guarantee - simply register your new Garmin nuvi 550 within 90 days of first using your sat-nav to see if a free map update is available. See map coverage below for more details. When loaded with optional BlueChart g2 marine cartography, the waterproof Garmin nuvi 550 provides detailed chart-specific information, spot soundings, tides and currents, wrecks, port plans, restricted areas and more. The mapping and memory card slot is located within the waterproof battery compartment to avoid water damage. Just select the boating mode and pair with optional marine mount to take your adventures to the water. Garmin nuvi 550 is ideal for the occasional boating enthusiast who wants one navigational device for foot, car, bike or boat. Garmin nuvi 550 takes walking and outdoor pursuits in its stride, with shaded, contoured maps and sunlight-readable, waterproof touchscreen. Select the walking mode to activate the built-in compass page, journey track log and integrated Wherigo / geocaching player. Or plug in optional topographic mapping for routing on road, track and path, with detailed contours, geographic points and shaded terrain. Garmin nuvi 550 fits comfortably on your scooter or cycle for GPS navigation on two wheels. An optional scooter mount provides a secure fixing to cushion against vibration from your travelled terrain. The user interface is simple to control on the move and, with voice-prompted directions via Bluetooth, you can enjoy safe, clear directions on the go. Its rugged UVA/B and fuel-resistant design make it a trustworthy companion, while the waterproof casing braves all weather to give turn-by-turn directions for the most direct route in the quickest time. Just select the bicycling mode and you’re away. Navigation is just the beginning. Garmin nuvi 550 includes many travel tools, including a world travel clock with time zones, currency and measurement converter, calculator and more. Show off photos of your all-terrain excursions with the integrated picture viewer and discover Garmin Extras to get even more mileage from your Garmin nuvi 550. You will find free downloads including custom points of interest and brand new vehicle icons from the Garmin Garage. Available third-party travel guides include The Good Pub Guide 2008 and Falk Marco Polo Travel Guide for directions to thousands of recommended places to drink, eat and visit. The Garmin nuvi 550, like all Garmin sat nav's, gets its speed camera data from the Cyclops speed camera database. The database provides advanced alerts to fixed, average speed, mobile, variable, temporary roadwork, red light and red light speed cameras. As you approach a camera, your device sounds an alert. Subscription charges apply. Click here to read more about the Cyclops speed trap database. The Garmin nuvi 550 has been designed to be plug and play, and as such can be transferred from vehicle to vehicle with ease. The Garmin nuvi 550 is powered with the 12-volt vehicle power adaptor and attaches to your vehicles windscreen via the Garmin nuvi 550 suction cup bracket. Alternatively with the dashboard disk you can mount the suction cup bracket on your dashboard instead, all three accessories are supplied with the Garmin nuvi 550. The Garmin nuvi 550 is preloaded with City Navigator NT for the UK, Ireland and Western Europe (22 countries) provided by NAVTEQ. NAVTEQ maps provide high quality detailed street level maps, which in addition to street information include features such as route calculation, Points of Interest (POI), Estimated Time of Arrival, and more. Further Garmin nuvi 550 maps are available SD card which insert directly into the Garmin nuvi 550. 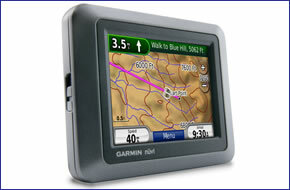 Available Garmin nuvi 550 maps include North America, Australia and New Zealand, Middle East and Southeast Asia. Garmin nuvi 550 maps. Looking for accessories to use with the Garmin nuvi 550 handheld device? We sell a vast selection of genuine parts and spares including nuvi 550 carrying case, suction cup mount, vehicle power charger and replacement battery. View accessory page here. Optional Garmin maps for Garmin nuvi 550 are supplied on SD/microSD Card, these include; street-level road maps - perfect for cycling of using your nuvi 550 in a car, 1:50k and 1:25k Ordnance Survey maps - ideal for hiking and walking the countryside of Great Britain and marine BlueCharts - ideal if you want to navigate the waters around the UK, Europe or further afield. Learn more about the optional range of maps that you can add to the nuvi 550 here. Question: I'm looking for a motorcycle hard wire for a garmin nuvi 550, do you stock it and how much? Answer: The hard wire power lead you require was discontinued by Garmin several years, we sold out a long while ago. Current accessories for the Garmin nuvi 550 can be viewed here. Do you have a question about the Garmin nuvi 550? Submit your question via our contact page.